Bite Me – A Nana’s Cookies Review and Giveaway! Earlier this summer, I posted a recipe for a dairy-free, gluten-free ice cream cake featuring So Delicious Purely Decadent Coconut Ice Cream and Nana’s Cookie Company Cookies. I tweeted about it, and a short time later, Nana’s Cookie Company contacted me asking me if I’d be interested in doing a review and giveaway on my blog. Yes, please! They sent me a lovely gift basket, so I could share with you what you’ll be getting if you’re the winner. This is what arrived. Whew, that’s a lot of cookies. So, I decided to throw a little shindig and have some of my gluten-free and gluten-full friends over for a taste test. Here’s the spread o’ goodies. I’ll share some of the comments about each flavor, but let me start with what I love about all their cookies. All of their cookies are gluten-free (of course!). But, they’re also refined sugar free (sweetened with fruit juices). They have no dairy, no eggs, no trans-fats, and no cholesterol. Their motto is “no never tasted so sweet,” and it is an apt motto. Taste-wise, these cookies are great. Now for the downside of things. Everyone agreed that texture-wise, these cookies still need work. One commenter stated that they had the mouth feel of compressed sand. Ouch! Another stated that they’re too floury and dry. We all agreed that we’d like to see a better, more cookie-like texture. On the positive side, texture-wise, crumbled in the ice cream cake and mixed with fudge sauce, the chocolate cookies were great. (My husband had proclaimed it the best part of the cake.) And, we all agreed that they would be excellent crumbled into yogurt or ice cream, as the sandwich part of an ice cream sandwich, etc. Can you sense a trend? We wanted them to be moister or firmer – either crunchy or melt in your mouth. As is, they are in some strange never-never land in between. But, let’s get on to the flavors, because we all agreed that Nana’s has some killer flavors. We started with the Ginger Cookie. If you like ginger, this flavor is for you! It packs a spicy wallop. Me, I love ginger – ginger tea, ginger stir fry, ginger bread. I loved this flavor. My son must take after me, because this is the one he kept coming back to as well. The other kids in the room were less impressed. It’s sort of a grown-up flavor, and does have a bit of a bite. No one ranked this one their favorite. From there we moved on to Lemon. We had the lemon flavor in the large cookie size and the bite size. Everyone agreed that there was no real flavor difference between the two (the ingredients are identical). The large cookies are listed as 2 servings at 180 calories each. We recommend the bite size, unless you’re sharing with a few friends. Back to the flavor. Our non-lemon loving friend was pleasantly surprised by this one. She almost didn’t even try it, but said she was glad she did. The lemon is light and not overpowering. There’s no fake lemon taste. People seemed to think the texture was a bit better on this flavor as well. Two people ranked this one their top pick. There are 2 chocolate varieties – Chocolate Crunch and plain Chocolate. We imagined the taste would be same between the two, with the exception of the crunch bits (puffed rice). That wasn’t the case, and everyone preferred the flavor of the chocolate crunch over the plain chocolate, which some remarked had a bit of an odd aftertaste. The crunch bits, though, were not loved by all. I found them more chewy than crunchy. They stuck to my teeth in an annoying way. But, I agree that the flavor was excellent on the chocolate crunch variety. Everyone that didn’t pick lemon picked chocolate crunch as their favorite flavor. Our last flavor was the Nana Banana. This one was the least favorite of the bunch. It was deemed a bit too sweet, and again, these cookies had the crunch bits, which seemed out of place, especially because you’re not told that there are crunch bits in there. Overall, we liked the ingredient profile of Nana’s Cookies. We love that they are virtually allergen-free and can be eaten by almost everyone. (Sorry folks that can’t eat rice – yet again, these are out for you.) And, we see a lot of potential in these cookies. But don’t take our word for it. You can get your own gift basket to sample! Here’s how to do it. Go visit Nana’s website and sign up for their VIP newsletter (for coupons and other promotions). Come back here and leave a comment letting me know you did, and letting me know what flavor you’d most like to try. For bonus entries, do any of the following, and leave a separate comment for each one, letting me know you did. Follow me on twitter (@themommybowl). Follow Nana’s Cookie Company on twitter (@nanascookieco). Tweet about this giveaway and include @themommybowl and @nanascookieco. Post about this giveaway on your blog with a link back to this blog post. The contest will be open for 1 week. I’ll pick a random winner on August 21st. Good luck! 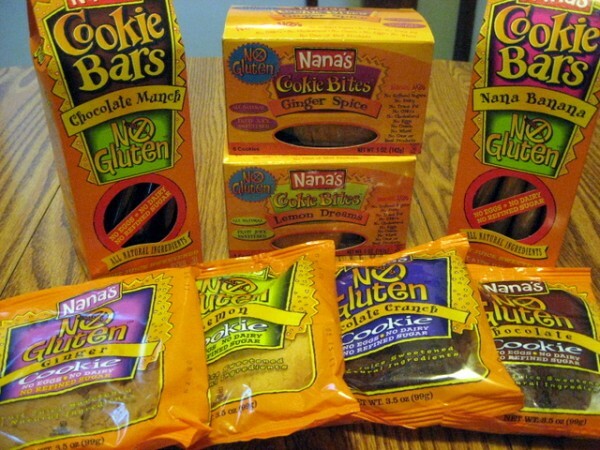 Disclaimer: Nana’s Cookie Company provided me with free samples of these products to review, and I was under no obligation to review it if I so chose. Nor was I under any obligation to write a positive review in return for the free product. 33 Responses to Bite Me – A Nana’s Cookies Review and Giveaway! I’ve signed up for the VIP newsletter…I wanna try the lemon! I’m stalking you on Twitter, D! I’m stalking Nana’s Cookies on Twitter, too! And I retweeted about the giveaway…I think I’m obsessed. Oh, and I’m following your blog in Yahoo reader. I just started on this eating-gluten-free thing, so I am looking for some cookie options that I can actually eat. I signed up for their email newsletter, and I would love to try the ginger flavor. I am now also following Nana’s on twitter. I was already subscribed to your blog through Google reader. Pingback: Gluten-free (and vegan!) Giveaway Goodness! « Inspiration. Perspiration. Dedication. 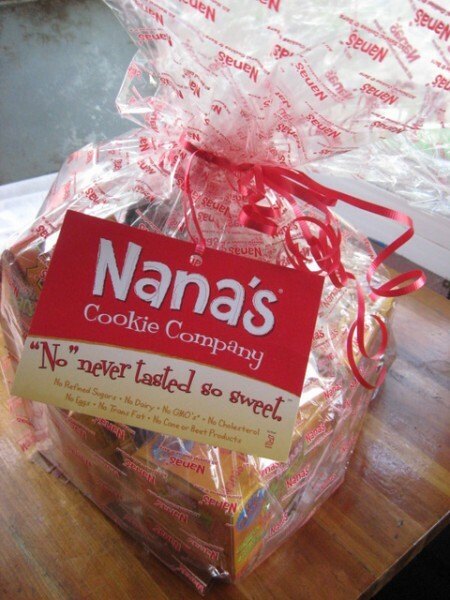 Love Nana’s cookies – I just signed up for the VIP newsletter. I have actually tried all the flavors, but have only been able to try the Ginger flavor once, so am most interested in this flavor. Hooray for giveaways! I’m following you on my RSS reader. Thanks for including me in the tasting party. And I tweeted. Or retweeted actually. I signed up and chocolate chip! Really craving chocolate chip cookies lately. I wasn’t following you on twitter – shame on me. I am now! I signed up for the newsletter, I wanna try the ginger!